Stay in the heart of the action, at The Argyle Street Residence. 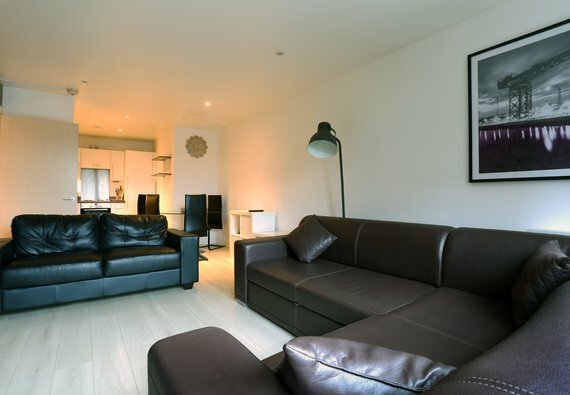 Located just minutes from all of the main shopping and sightseeing that Glasgow has to offer; this modern, one bedroom apartment is perfect for both cultural and retail visits. The open plan living/dining room and kitchen is the ideal space for relaxing after a long day exploring the city, or planning your next adventure. Large leather sofas invite you to put your feet up, whilst the fully fitted kitchen comes complete with dishwasher, microwave and coffee machine. The Juliet balcony provides notable views to the West across the Kingston Bridge. A sofa bed accommodates an extra two guests, perfect for the budget-conscious traveller. The master bedroom boasts a super-comfy double bed and plentiful guest storage, and the family bathroom with shower over bath completes this delightful home from home. A meet and greet service is provided, whereby you will be met near the property to be provided with keys and to be shown the property. Please arrange your arrival with the property manager. No reviews yet for The Argyle Street Residence.